When the idea of a mobility scooter first crosses your mind you might not think of it, but there are a few things you should know before making the jump. For a heavy person, the standard models of electric mobility scooters might not cut it and they need something with an exceptional build quality and a roomier seat in order to make their ride truly enjoyable. Unfortunately, if you’re overweight then the options to choose from gets narrowed down due to the fact that most mobility scooters have their max capacity set at -300lbs. However, fear not. There are a few great options left and even though they might be pricey compared to the standard scooters, they do provide much better comfort, stability, and build quality. However, fear not. There are a few great options left and even though they might be pricey compared to the standard scooters, they do provide much better comfort, stability, and build quality. We’ve hand-picked the best heavy-duty mobility scooters which can carry up to 500lbs, in order to provide you with a stable, comfortable and smooth ride no matter the numbers on your scale. We have tested 11 heavy-duty electric mobility scooters and now we’ve narrowed down our 5 top recommendations. 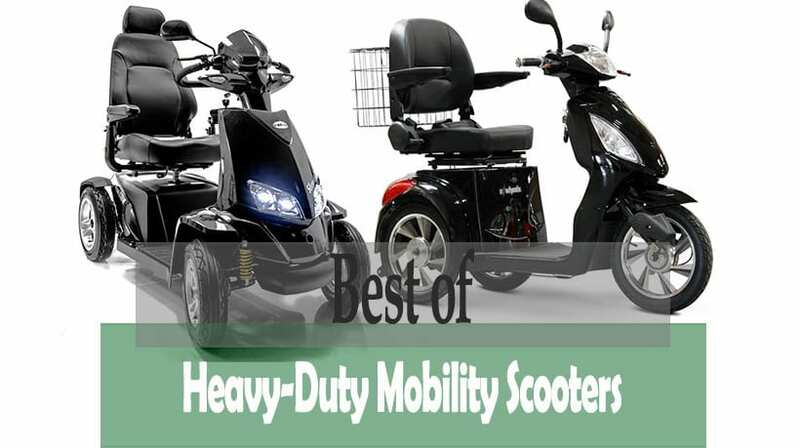 All of these are great options for heavy people who need a sturdier and more purpose-built scooter in order to accommodate them in their everyday life. 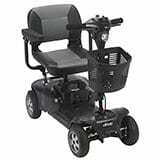 The Pride Victory CTS is the top model among the pride mobility vehicles. It comes with both front and rear suspensions which do provide a really comfortable riding experience. It has a full LED-light system giving you a great view of the pathways and surroundings, even at night. Its seat is made especially for the Victory unit giving it highly personalized features such as; front-to-rear slide, up/down adjustments, and you can even buy a custom-made seat for a small cost giving you even greater comfort. It’s equipped with their feather-touch disassembling process, which claims that with one hand, you’ll have it ready for transportation in as little as 60 seconds. The Pride Maxima is equipped with 4 wheels which are a must in order to give heavy users great stability and riding experience. The Maxima has a weight limit of 500lbs which is as high as it gets. It possesses great stability and they’ve recently upgraded the seat to give its user a much more comfortable ride, even if you’re close to the weight limit. Great build quality, high weight limit suitable for transporting heavy people and to do so while at the same time providing them with premium comfort. The Maxima does all these three with ease and its former customers have been more than happy with their purchase. It can take on up to 500lbs users mainly because it’s built with a one piece frame and has solid tires, so you won’t have to worry about getting a flat tire. 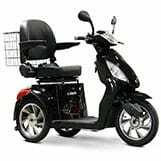 It gives the rider great comfort with an enhanced rear suspension system and a sturdy well-cushioned seat with armrests, all highly adjustable. 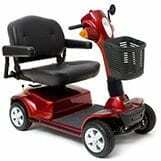 It has a great top speed of 5.25 mph and can take you for a ride up to 16 miles on a single charge. The new version has an upgraded electrics system and an extra strong drivetrain for more power and the ability to handle even the heaviest tasks. It comes with a highly adjustable tiller and front lights. The motor is quiet so you can enjoy a nice and quiet ride. The EW-36 from E-wheels is one of the fastest mobility scooters around. It does an amazing 18 mph and has an incredible distance of 45 miles on a single charge. It will give you some good fun riding around on it and it is definitely an eye-catcher. The EW-36 looks like a traditional scooter except for having 3 wheels it functions much like one too. You get good speed from its high powered electric motor and a distance that will take you basically anywhere you might want to go. Starting out there were some people who experienced wheelies when loading the basket behind the seat with groceries. Some see this as a cool feature whilst others might find it scary. They came up with a few solutions to handle the grocery shopping problem. For one they introduced a carrier that fits behind the EW-36 scooter and it has a maximum loading capacity of 300lbs, which should be more than enough to go shopping. Others trimmed down the top speed when loading much in order for the scooter to not pop a wheelie unintentionally. A nice looking scooter with great stability even though it’s a 3-wheeler. It makes it possible for you to go further and faster than you’d probably ever need. According to previous customers, this isn’t an appropriate scooter for elderly people due to its high speed and if that is the case, then we highly recommend that you choose a more suitable senior-friendly transportation. Drive Medicals own heavy-duty scooter is the Phoenix HD4 which can carry about 50lbs more than the standard vehicles. It has great features at an affordable price. If you’re buying the Phoenix HD4 you are looking for an affordable heavy-duty scooter which covers the basic needs of the user. You’re touching the 300lbs weight limit of other scooters and need something just a little bit sturdier in order to get around comfortably. When we first tested the Pheonix HD4 the first thing that we noticed is that it doesn’t have a much heavier weight limit than many of the other scooters we reviewed. It does, however, provide better comfort to the rider and has better suspension giving you a much smoother ride. It provides you with a decent amount of features such as the finger-pull throttle, a great feature for those of us with limited strength or dexterity in our hands. What this heavy-duty scooter gives you that none of the rest does is the ability to disassemble it into 4 easy to carry pieces which load into the trunk of most cars. The Golden Avenger is a heavy-duty mobility scooter that provides great comfort because of its great and highly adjustable features. It takes you on a comfortable ride on even the most challenging and unforgiving surfaces such as gravel and lawn. Those who buy the Golden Avenger is looking for a heavy-duty scooter that gives them great speed, comfort, and distance even on the most unforgiving terrain. That’s why the Golden Avenger is their scooter of choice. There is something very stylish about the Golden Avenger and it has a more nostalgic look than the more modern looking scooters. The key things that make the golden avenger such a great choice for heavyweight people are its ability to adjust to your personal preferences. 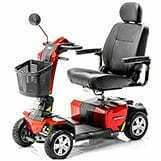 The seat is swivel mounted which helps tremendously when trying to get on and off and it comes with armrests and a well cushioned extra roomy seat with headrest. As a standard, it gets delivered with a full light package and a large front basket for your convenience. You’ll be able to adjust the scooter to your needs with its flip-up armrests which can be adjustable in both height and width, a height adjustable chair with swivel and the height adjustable headrest for excellent personalization of your new vehicle. The tiller can also be positioned as per your needs for perfect reach and maneuverability. It is powered by 2 NF-22 batteries which give the scooter with a maximum reach of 18 miles at a speed of 7 mph, which is the fastest heavy-duty scooter we have reviewed. The benefits of a heavy-duty unit are self-explanatory in terms of being able to provide overweight people with a selection of specially manufactured scooters that can fill the needs of a person of heavy weight. The downfalls are however small and if you’re above the 300lbs mark, or close to it, you are better off buying one of these instead of buying one of the cheaper -300lbs alternatives. The HD units are great and the list below will give you an idea of the what you might loose and gain for buying one of these heavier models. The fact that they are often more stable, comfortable and luxurious than the normal scooters. 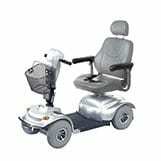 Comes with stronger batteries which give you a higher speed, more torque and more miles per change. More luxurious features, for example; Full light system, a more stylish design, LED-display with tons of features and they are often highly adjustable which mean that you can personalize it to fit you perfectly. The price tag. They are often much pricier than standard mobility scooters. Total weight is often high and they rarely have the ability to be disassembled into smaller parts to ease with transportation. Bigger making the need for a transportation ramp or trailer a must. Finding the right choice for you often comes down to personal needs and the main purpose of the scooter. Some have 2 different scooters one for going the distance and one for getting around at home. However, there are some versatile scooters that can take you around in your home environment and still be able to get you to the store and back without a giving you less comfort. When you start looking at our list you’ll notice that most of the options we’ve arranged for you have 4-wheels. Weight distributed over four wheels instead of three gives you less chance of a flat tire or a broken wheel, and it makes the scooter able to take on even heavier load. What you might lose going for the 4 wheel option is turning radius. You cannot beat a 3-wheel scooter when it comes to turning radius, but what you lose in terms of turning radius you get back in greater stability, ensuring you a smooth and safe riding experience. What type of battery you need in order to get you around comfortably and with as little downtime as possible is much depending on your riding style, terrain, and inclines. If you’ll be riding over rough terrain, longer distances and with many start and stops. Then you’ll be better off getting a scooter with a strong battery and lots of amperes which can take you greater distances without having to be charged ever so often. If you consider just using it for small commutes, around the house and neighborhood than a smaller scooter and battery will get the job done without a problem. They are lighter and can be stored away much easier than one of the heavy pieces which often needs to be placed in a garage, outside or in the hallway. When buying a heavy-duty scooter you want to understand that the more features and power you get the heavier the unit. Some of the heavier scooters are definitely a 2-man job to load into your van and we wouldn’t recommend getting one of those if you don’t always have a helping hand available. If you need the bigger scooters then you should consider buying a ramp for your mobility scooter in order to ease with transportation. These can be very useful in terms of transporting your scooter greater distances. So you’ve just gone through our reviews on finding the best heavy-duty mobility scooter. These scooters are built for high weight limits and their main purpose is to be able to accommodate people above the standard scooters 300lbs limit. Remember that the scooters might have more features, power, and stability than the normal scooters, but the units are also often heavier and have less than optimal folding, which means that they aren’t as easy to transport. We sure hope that you’ve found a good scooter by now and are ready to maximize your pleasures in life.